I have been so excited about this weekend that I’ve felt like a kid at Christmas! A week or so ago my sister emailed me and said she didn’t have class on Thursday or Friday. It turned out that my kids had a fall break on the same days, so she and her husband decided to come down for a few days. design a Christmas quilt and shop for fabric, hit the thrift store in search of cool old picture frames, do something creative in general. 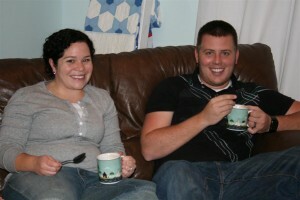 This is my lovely sister Kristen and her husband Jake. Thursday night we went to the thrift store and had a blast. Now, I enjoy looking for wonderful old things, but usually I’m doing it alone. I learned that it’s much more fun when you’re with a friend. I had so much fun! Kris bought some cool old frames for a project she’s working on. Here’s what I found. 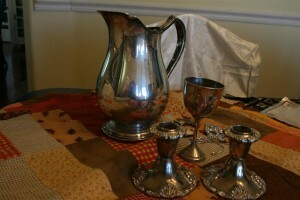 The pitcher is silver plate, but was black. I bought it for $5.00 and polished it a little when I got home. 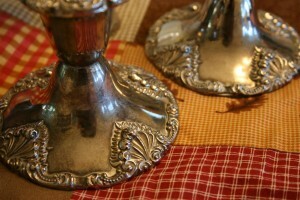 I’m not usually really into candlesticks, but they were pretty and really inexpensive. And I love the little cup. I’m totally into silver things on pedestals. 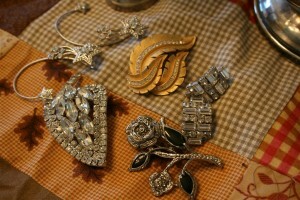 And for the first time in my life, I decided to sort through the vintage jewelry. I think I scored pretty well, and now I have a few things to play with. 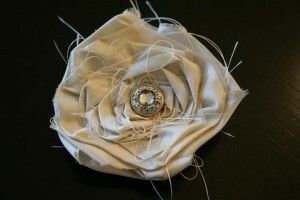 I’ve got a bunch of ideas bobbing around in my head involving fabric, rosettes, vintage rhinestones, and so forth. The big rhinestone broach is about 2 1/2 inches long and every stone is clear and intact. 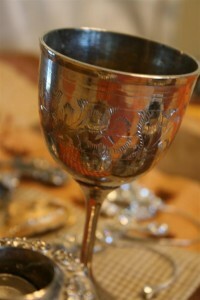 And the rose is actually quite pretty with the marcasite. It was $1. Lots of fun! 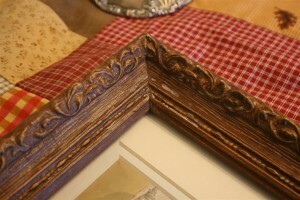 I also picked up an old picture frame that will look great painted white. We came home happy! It was a lot of fun. Yesterday involved a little bit of cooking, taking care of all the children, and a trip to the spa for a pedicure. Kris gave me a gift certificate for my birthday which I hadn’t used yet. This is the ONLY time I wear flip flops. Don’t our toes look pretty? 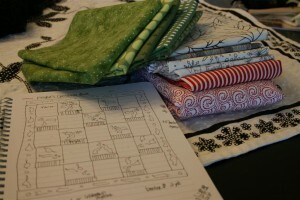 After the pedicure we went to work on the Christmas quilt idea. I had some ideas in mind, and when I sketched them out, she liked my proposal. A little math to work out the pattern and generate a shopping list, and we were off! We’re trying a twist on the traditional Christmas color scheme by tossing in some black and white. 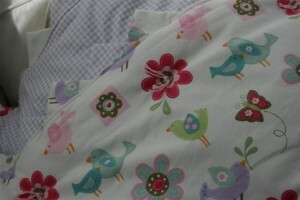 We found a great bunch of fabrics that she really likes. 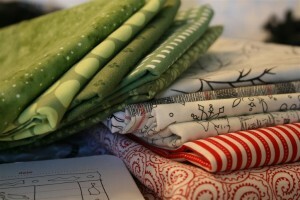 It’s way too much fun to shop for fabric. It’s like shopping for clothes, but you can buy a little bit of every color and pattern that you like and you don’t have to worry about whether anything fits because the creating is all up to you. We’re going to try to cut it before she has to leave for home. If we don’t get to it, we’ll have to plan another weekend like this soon, very soon. 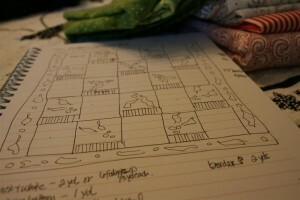 I’m liking this project so much that I’m feeling tempted to make one for myself as well. So far I’ve resisted, though. I tried my hand at making my first rosette with some silk fabric. Needs some work and I could use a real lesson in how to do it. I was just sort of making it up. Last night my brother and his wife came over for a late dinner, an impromptu movie, hot chocolate floats and a hilarious reading of my 10 year old daughter’s most recent story. 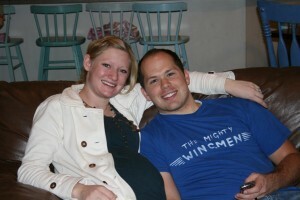 Brent and Christa are awesome; they are expecting their first baby in just a few weeks. They’re like we were, stuck on a name. 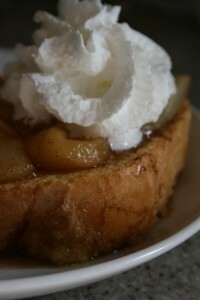 This morning we made some pear french toast and got the logo she designed for my blog all set up. (Hope you like it; I do!) Little sisters are the best! So, we’re about to wrap up the weekend without any finished product, per say, but we’ve had so much fun and are full of plans. We miss our Mom and other sister and have to do this again soon. 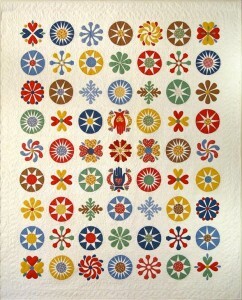 After all, we’ve got a quilt to make. We’ll show it to you soon!